Dual-WAN Firewalls run simple software that has limited visibility of Internet problems, and can only control outbound traffic. When they failover your traffic between ISP connections your IP addresses change, causing many sessions like VoIP calls, virtual desktop, and VPNs to drop. Bigleaf instead provides end-to-end Internet visibility, and seamless Same-IP Failover, protecting your traffic sessions at all times. Load-balancers often boast of “Seamless Failover” and “Quality of Service”, yet those promises are full of caveats and fall dead in many circumstances. These devices provide inbound-failover based on DNS, so unless you’re hosting a website in your office, they don’t offer any improvement beyond basic Dual-WAN Firewalls. Their failover isn’t seamless for traffic bound to IP addresses, like VoIP and virtual desktop, so your users have to reconnect; and their Quality of Service only (sometimes) works for outbound traffic, not inbound, so VoIP is choppy and other apps suffer. Bigleaf provides true Seamless Failover and Quality of Service for top cloud performance. Our Same-IP Failover moves traffic between ISPs without dropping any sessions, and our Dynamic QoS provides true prioritization of real-time applications like VoIP across the public Internet, both for upload and download traffic. BGP is a great routing protocol, in fact it’s what the Internet runs on. However, it has many limitations. BGP-capable routers are expensive and very complex to set up and maintain. Also, BGP is completely unaware of Internet performance issues like packet-loss or jitter, so it load-balances blindly with no intelligence. Bigleaf is kind of like BGP with a brain and really long arms. We include in-depth monitoring and Intelligent Load-Balancing that adapts to changing Internet performance. Our system is also low-cost and super easy to implement, making you look like a hero and allowing you to focus on other projects. SD-WAN is the next generation of networking, yet the way it’s implemented needs to be carefully considered. Other SD-WAN solutions are architected for private networking rather than cloud connectivity. They require you to replace or severely degrade your existing firewall, risking PCI-DSS and HIPAA compliance issues. Plus they’re complex to deploy and manage, and they treat traffic inconsistently, so only certain applications get high-performance connectivity. Bigleaf Cloud-first SD-WAN is powerful but easy to use. Our platform is built to optimize cloud-connectivity, and support VPNs for private networking. We drop-in between your existing firewall and your ISP connections, so you keep your preferred security environment. Our system is totally plug-n-play, there’s no configuration required since our router arrives pre-configured and ready to go. If you need private networking you can then run secure site-to-site VPNs from your preferred security vendor across our stable and adaptive internet connection. 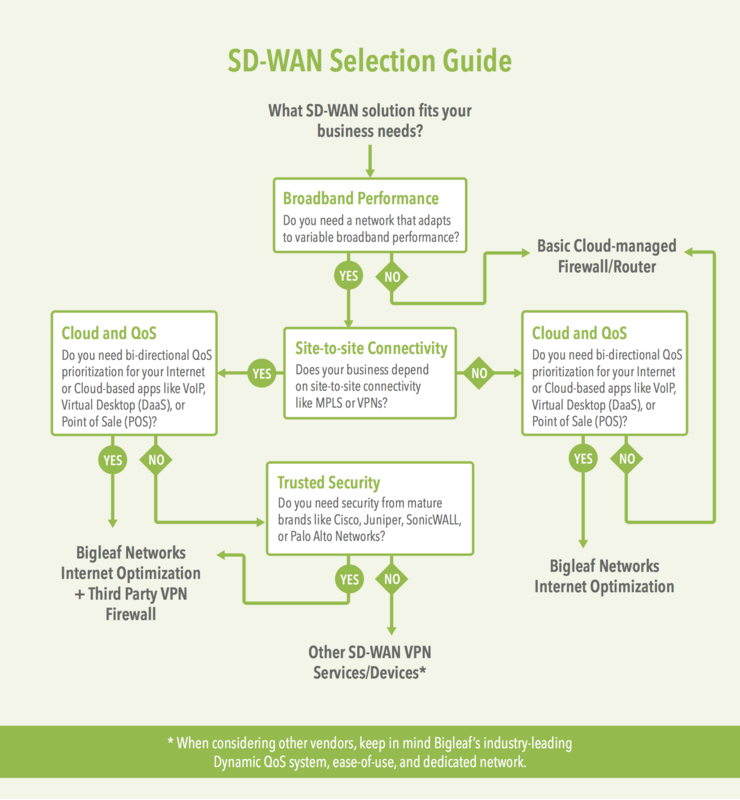 Here’s a handy infographic to help you compare SD-WAN options. Check out our blog post: The 3 Categories of SD-WAN Revealed for more details.